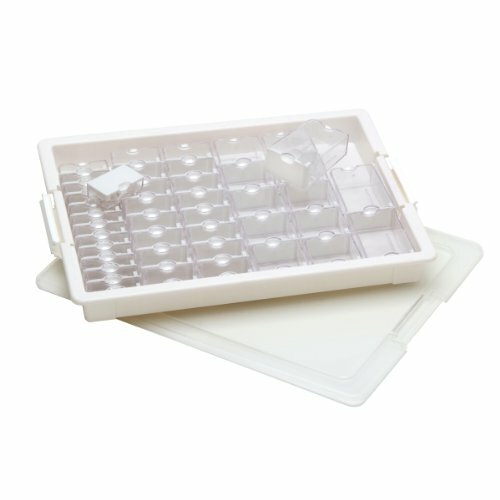 Darice Elizabeth Ward Bead Storage Solutions: 45-Piece Assorted Storage Tray, 42 Containers of Various Sizes with a Tray and Lid for Beads and More, EWC0510. Made of clear plastic, all your beads and supplies are easy to see at a glance and stay in one spot when in this storage solution, keeping your craft area neat and organized. - STACKABLE - These bead storage boxes are stackable, so you can have your entire bead and craft collection in one space with this easy-to-see storage solution. - EASY ORGANIZATION - Keep your crafting area neat and clean and all your supplies in one place, thanks to this bead storage tray. The crafting storage containers are removable, too, so you can bring the necessary supplies to wherever you may be. - PIECE STORAGE TRAY - Keep all your beading essentials in one place with this 45-piece assorted storage tray. It contains a 13.75" x 10.5 " x 2" tray, 1 tray lid, 1 sheet of labels and 3 large containers, 10 medium containers, 16 small containers and 13 tiny containers. - STORE BEADS AND SUPPLIES - Not just for beads, you can store other crafting supplies in this storage box, too. It has a clear, snap shut lid, making it easy to quickly see all your items at a glance without opening the box.